I've been thinking... January blues aren't so bad. I'm not participating in 'Dry January', perhaps that could be why?! There's something strange about spending the first proper day of the new year being a year older than you were the day before... I suddenly feel ancient, but I suppose that's because I'm finally settling into adult life and I'm ready to start a new year with more consistency than the last. I also get to say this really cool thing that no one ever believes until they waste 10 minutes of their life working it out. On the 1st of January 2017, I could say 'I was 21 last week but I'll turn 24 next year'. Yes - it really does add up and it's kind of depressing... I'm also heading off to the Alps on Saturday so my January isn't really looking that bleak at all! I found this beauty of a dress in the Zara sale - I'm surprised I'd never spotted it before because it is such a me sort of dress; houndstooth, check, tweed, check, frilly, check. I took these photos on my 22nd Birthday (NYE) and had the loveliest day spent brunching at The Ivy in Clifton, hunting for cool antiques, opening pressies and celebrating the new year with family and friends. The belt was a present from my incredible Grandma. An investment piece I'll wear time and time again and keep forever and ever. It just adds an extra touch of luxe to any outfit; whether that be vintage denim or over the top of a velvet blazer. That dress looks so great on you! 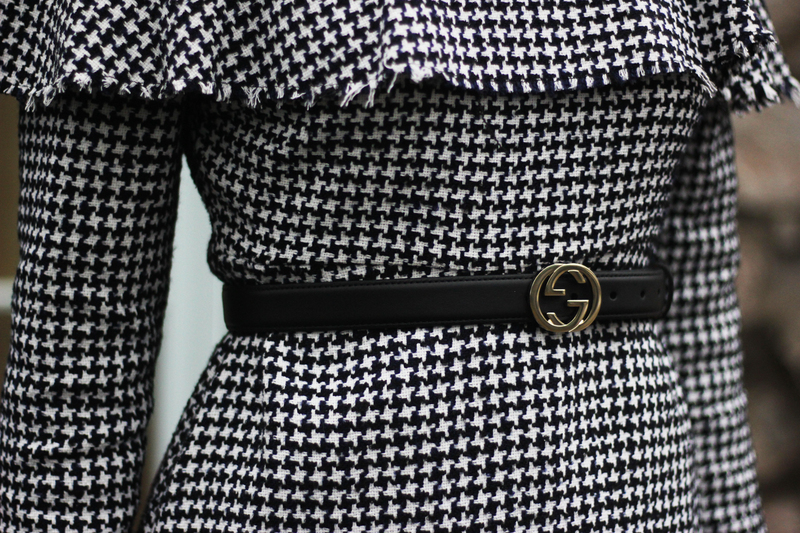 Houndstooth has always been one of my favourite prints, and I just love it on the dress.